The National Roads and Motorists Association (NRMA) is engaging in content marketing with the launch of its Living Well Navigator, an online content community for over-50s offering resources and social opportunities around lifestyle, health and employment. The content website provides support for over-50s in the workforce in response to the Australian government upping the retirement age. The site aims to challenge generational stereotypes. A series of articles fit into the categories, ‘Getting Around’, ‘Independent Living’, ‘Supported Living’, ‘Travelling’, ‘Work & Volunteering’ and ‘Health & Wellbeing’, while a ‘Community’ section hosts forums for users to connect with each other. NRMA says it has drawn on its knowledge of the over-50s market to create the content along with content marketing agency King Content. 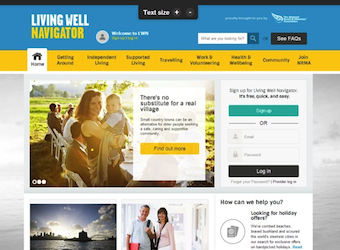 The Living Well Navigator includes a dedicated jobs portal to connect mature jobseekers with age-friendly employers, as well as providing interview-preparation support. NRMA president Kyle Loades said the website would aim to provide help for mature-age jobseekers to find and hold good jobs. Age discrimination commissioner Susan Ryan AO said the site would advance key goals in realising the value of increasing longevity. NRMA is hosting free community events across New South Wales to celebrate the content marketing site launch and will give away an Optimum Wellbeing 50 Plus holiday for two at the award-winning Gwinganna Retreat in Queensland.